A Nikon 105mm f2.5 for my Nikon SP. Can't wait to get it! I bought and then sold a near-flawless Yashica Electro 35 GTN. Its unpredictable metering became my worst enemy at around shot #3. I couldn't resist buying a second Hexar RF body last week, a single-reel Paterson development tank and a set of light seals so I can get my old Olympus XA working again (I suspect the XA will need to find a new home so I can prepare for some more gear in the near future ...). Strange, I found both of my Hexar RFs on the bay in France. I've been monitoring Hexar offerings all over Europe, and a very large portion of them keeps coming from France. This camera must have had a lot of fans in France. My most recent purchase was my M4, 50 'cron and 35 'lux. I don't think I'll buy any more gear in a long time, it's pretty much all I need. Actually I might sell some Canon gear. A Canon 5Dmk2. I don't know why. I must have been having a bad day or something. A 52mm UV/IR filter so I can stop myself from getting any gunk on my 15mm Heliar... But WHY did I need to spend more on the UV/IR???? Just sold a D40 and lens on the bay, and immediately used the paypal credit to pick up a Lumix 45-200 for the GF1. Probably a little front-heavy for a combo but the GF1 is my only digital and I "need" a tele-zoom for it. So far I like the XTOL a lot, not sure which film I'm going to pick though. Foma was OK, magical on the good shots but questionable quality in general. Not impressed with the Rollei in XTOL, but I may have under-developed it, hence the second roll of each. Next up, either T-Max or some HP5+ I have sitting on the shelf. Decisions, decisions, what a problem to have. ... and I sold my Leica R7 and want to sell my Minolta CLE (+28/40/90). No gear, but a bottle of Rodinal. Bought the last one 16 years ago!!! And some Fuji Acros ISO 100 120film and Rollei(?!) film ISO400 120film. Last edited by chrismoret : 11-25-2010 at 09:24. Just bought a Rolleiflex E3 3.5 because film continues to satisfy like nothing digital. A P7M8, some Matt DelFatti leather, and.... oops. wrong forum. the Tewe 35-200 VF is new. It's waiting to be joined by a IIIf. Sony NEX 5, and a couple of adapters; a cheap LTM version and CV M-mount. Can't wait to try out my ancient RF lenses on a digital camera. Especially looking forward to using one of my favorites on the Sony, a CZJ Biometar in Contax mount, hooked to an original Orion adapter. Zeiss Maximar 6x9 plate camera; smaller cousin to my Z-I "Donata" 9x12 plate camera. I have RADA 120 roll films backs for both. Just bought a 35mm f/1.7 lens for Micro 4/3 from a company named SLR Magic. It cost about $77 "net to the seller". Serious hardware! Photo(s) of this kit, please? VC Nokton 35mm f/1.2 (used). Nice lens! A preowned M7 and a new D-Lux 5. Can't wait to get them. Made a down payment at a local camera shop for a nice '81 f/1 Noctilux. First time I've seen one at a local shop and since I wouldn't dare buying something like this unseen over the internet... I sincerely hope I won't have a change of heart anytime soon haha. I told the shop owner I'd pick it up end of January most likely. Leica V35 Enlarger- Back to film! Just bought a Voigtlander 21mm viewfinder, to use it on my R-D1 with my Voigtlander 15mm. Last edited by gekopaca : 12-13-2010 at 13:06. A Nikon F4s and some GP Recyko's and a ritzy charger, Technoline bc-700. Oh and an MD-4 motor for my F3 and an unused Nikkor 50 f1.4 AIS. I really must sell something! Tickets for a trip to take pictures! Kind of hard to top that, trips are (usually) money well spend Where to? Next item on my list for sure! I just bought a Summicron-M 2/35 1st version ... a wonderful lens! I bought an M6 Classic last week. I find myself doubting the light meter. We shall see how the first roll from it turns out. Summilux-M 50mm f/1.4 ASPH. 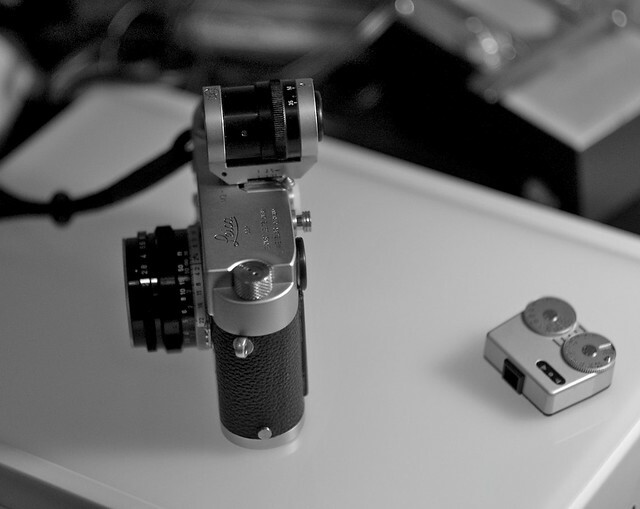 Sold a Summicron 50 and a Summilux 50 pre-ASPH. Artisan & Artist red silk cord. Ahhh, now why did you have to go and do that Bob? Now I have to get one! Red, nice!